The biography of the supposedly historical Buddha is recorded in the Buddhist canon, written four centuries and more after his death. This story was embellished by the Ceylon chronicles, written in the fourth and fifth centuries CE. Even if there had been a historical Buddha, this personage would be so overlaid with myth as to be impossible for the real man to reemerge through the mist of time. 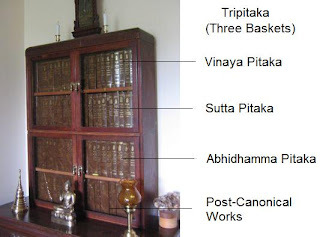 The Canonical Pali literature is divided into three main divisions called pitakas (baskets), and the Buddhist scriptures are consequently called the Tripitakas (Three Baskets). "All the books in the Tripitakas that contain [supposedly] historical matter and discourses are composed in the form of anthologies. Consequently a consecutive chronological account of the Buddha's life has to be pieced together from material scattered all over the Vinaya and Sutta Pitakas. Those books do contain a picture complete in itself and contrasting in its simplicity with the ornate and florid later versions (the Sanskrit Lalitavistara, for example, or the less known introduction to the Pali Birth Stories in Buddhaghosa's Jataka Commentary). Compared with these, the account it provides of the period up to the Enlightenment seems as lean and polished as a rapier, a candle flame or an uncarved ivory tusk." From The Life of Buddha, Bhikkhu Nanamoli. "The Buddhist Pali Cannon is widely used for this period in spite of its imprecise chronology although some attempts have been made at a chronological stratification. Among the Buddhist texts, sections of the Digha, Majjhima, Sanyutta and Anguttara Nikayas are early. The Vinaya Pitaka and the Jatakas are later, some parts of which possibly date to the Mauryan period. The Jataka literature is more difficult to date as the verses in it are believed to be of an early origin." From History & Beyond, Romila Thapar. Hence the stories of the jatakas couldn't have been spoken by the Buddha; the verses were 'borrowed' from the Brahmins. See here for sources of the Jataka. Buddhist literature may be divided into 1) The Pali Canon (Tripitaka); 2) The Post-Canonical Works; and 3) The Sanskrit Canon (not shown). 1. CANONICAL PALI LITERATURE (4th century to 1st century BCE) The first pitaka is the Vinaya Pitaka (Discipline Basket), a large part of which is dry and technical reading; but there is interspersed much narrative of events of the life of the Buddha. The Buddha is himself supposed to have laid down all these rules as occasion suggested their necessity, and the object of these stories is to explain the circumstances under which he did so. Skeptics, of course, believe that the monastic disciplines were laid down first and then stories purporting to be of the life of Buddha were worked into the narrative to lend it sanctity. i. Vinaya Pitaka.......1. Sutta Vibhanga.............a. Parajika. The second of the three Pitakas, or Baskets, is called the Sutta Pitaka (Sermon Basket). It consists of a great number of sermons and discourses in prose and verse, delivered by the Buddha or some one of his disciples, and is extremely interesting to anyone studying the philosophy and folklore of Buddhism. ii. Sutta Pitaka.......1. Digha Nikaya. ............a. Mahaparinibbana Suttanta (& 33 other suttas.)......2. Majjhima Nikaya.............a. Three books each of 50 suttas.......3. Samyutta Nikaya.............a. Several samyuttas or groups.......4. Anguttara Nikaya.............a. 11 Nipatas. ......5. Khuddaka Nikaya.............a. Khuddakapatha. ............j. Jatakas : a collection of Buddhist folklore about previous incarnations of the Buddha, both in human and animal form.............i. Consists of gathas, or stanzas, and is divided into 22 sections (nipatas) which are arranged in a number of stanzas. The first contains 150 jatakas, the second 100 jatakas, and the third 50 jatakas. Composed in North India (Madhyadesa) by the end of the 2nd century BCE.............k. Mahaniddessa. The works composing the third Pitaka are, of all the Buddhist scriptures, the dreariest and most forbidding reading, and this is saying a great deal. However, like the Sahara desert, they are to be respected for their immensity. The title of this Pitaka is Abhidhamma Pitaka (Metaphysical Basket). 2. POST-CANONICAL PALI LITERATURE comprises mainly the extra canonical works, Pali commentaries and Pali chronicles written during the period extending from the beginning of the Christian era to the close of the 4th century CE or the beginning of the 5th century CE. Menander, Bactrian Greek philosopher-king of Northwest India, 115-90 BCE. a. 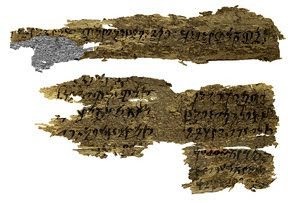 The most important extra canonical work popularly known as Milindapanha is based on the conversation between the Bactrian Greek King Menander or Milinda (circa 2nd century BCE, with his capital at Sagala, modern Sialkot) and Nagasena. Menander probably lived in the second century BCE, and the Milindapanha was probably composed about the beginning of our era. The Milindapanha is, strictly speaking, a North Buddhist work, but is considered orthodox by the South Buddhists (Sri Lanka, Burma, Thailand). Three of the most celebrated Buddhist scholiasts to whom several Pali commentaries are ascribed are Buddhadatta, Buddhaghosa, and Dhammapala. All of them went to Sri Lanka (Simhadesa) from different parts of India to compose commentaries in Pali. Buddhadatta and Buddhaghosa were contemporaries, circa 5th century CE. Writings include Samanta Pasadika, Sumangalavilasini, Papancasudani, Manorathapurani, Khuddakapatha, Sutta Nipata, Dhammapada Atthakatha, Katthavathu, Atthasalini, Jataka Atthakatha; Paramatthadipani, Digha Nikaya Atthakatha, Majjhima Nikaya Atthakatha, Samyutta Nikaya Atthakatha, Anguttara Nikaya Atthakatha, Jataka Atthakatha, Abhidhamma Atthakatha, etc. b. There are two important Pali chronicles, Dipavamsa is the oldest known Pali chronicle of Sri Lanka which deals with the history up to the time of Mahasena (325-352 CE), which can be ascribed to the 4th century CE. The other chronicle is the Mahavamsa, composed by Mahasama (5th century CE) which deals with the history of Sri Lanka up to the time of Mahasena.Psalms of the Sisters. Xuanzang traveled to India in the 7th century CE to collect Buddhist manuscripts which he took back to China and translated. a. Important Sanskrit Buddhist texts include Mahavastu, Divyavadana, Boddhisattvadana-Kalpalata, Mahavastu Avadana and Lalitavistara.